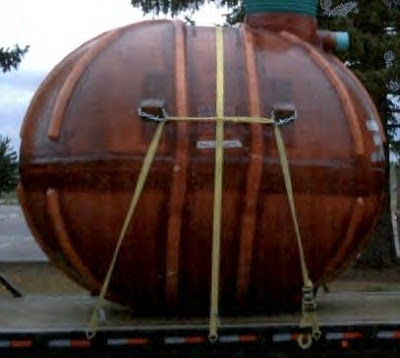 RCMP Alberta - On February 21, 2017 the Coaldale RCMP received a complaint of a theft of a 1000 lb fiberglass cistern worth $4900 taken from a Coaldale business. The cistern was stolen sometime on the weekend of February 10-13, 2017. Cisterns are defined as waterproof receptacles for holding liquids, usually water. They are primarily used for rural properties. Based on its size, the stolen cistern would have been hauled by a large trailer. Each cistern have unique serial numbers. This stolen cistern has serial #SN1700500. If anyone has any information in this crime or any other please contact the Coaldale Rural RCMP at (403) 329-5080/ Coaldale Municipal RCMP at (403) 345-5552 or Crime Stoppers at 1-800-222-8477 or through the internet at www.tipsubmit.com. Crime stoppers will pay cash rewards up to $2000.00 for information that leads to an arrest, the recovery of stolen property or seizure of illegal drugs. Crime Stoppers does not subscribe to call display and the identity of the caller will remain anonymous.